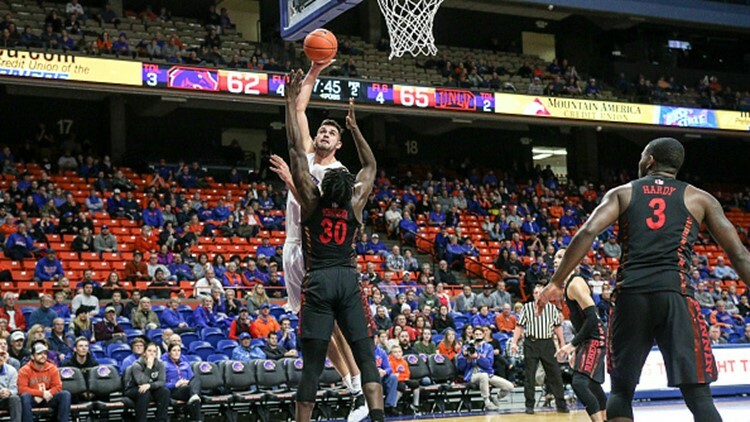 Boise State's Zach Haney shoots over UNLV's Jonathan Tchamwa Tchatchoua in the first half at Taco Bell Arena Feb. 6, 2019 in Boise, ID. UNLV won the game 83-72. The Mountain West TV contract has long been a thorn in Boise State’s side in football, with those legendary late-night kickoff times. But it’s worse when it happens during basketball season. BOISE, Idaho — Friday, February 8, 2019. Just two days after being seemingly left in the lurch by the resignation of Nick Holt, Idaho announces the return of Dennis Erickson as head coach. Holt had a 5-18 record in his two seasons, but Erickson—with two national championships and a legacy of college football turnarounds in his career—was expected to flip those numbers. We never found out, as Erickson lasted just 10 months before bolting for Arizona State, going 4-8 in his one season with the Vandals. He had started his head coaching career with Idaho in 1982, going 32-15 in four seasons. Erickson is now bound for the College Football Hall of Fame.